Well, well, well, up to now no working model for the electric universe has been presented. * I have not obtained an answer from MM on where exactly Birkeland calculates the dragging of the ions by the electrons, and I did go through lots of math pages in the book and wrote it down here. The solar wind, the supersonic stream of charged particles that flows out from the sun, moves out into space in every direction at speeds of about a million mph. The Earth's strong magnetic field shields our planet from the solar wind. The moon, with its relatively weak magnetic field, has no such protection, causing the solar wind to slam onto the moon's sunward side. Read asteroids, comet and moons without magnetosphere as well!!! From its vantage point in high earth orbit, IBEX sees about half of the moon — one quarter of it is dark and faces the nightside (away from the sun), while the other quarter faces the dayside (toward the sun). Solar wind particles impact only the dayside, where most of them are embedded in the lunar surface, while some scatter off in different directions. The scattered ones mostly become neutral atoms in this reflection process by picking up electrons from the lunar surface. This is only half right, which is typical of a mainstream press release, electrons "stick" to the nightside, ions "slam" into the dayside i.e The night side is negatively charged and the day side positively!!! The combined scattering and neutralization processes now observed at the moon have implications for interactions with objects across the solar system, such as asteroids, Kuiper Belt objects and other moons. The plasma-surface interactions occurring within protostellar nebula, the region of space that forms around planets and stars — as well as exoplanets, planets around other stars — also can be inferred. And COMETS Tusenfem, do try and keep up sport! That is my friends is PURE ELECTRIC UNIVERSE!!!!! As for point 3 see point 2! That is EDM a more energetic form of NASA/ESA's "sputtering"!! Ditto Astrofiend's and T Larsson OM's comments completely! These are entirely relevant questions in regards to quantitative measurements of these quantitative observations. No conspiracy theory needed here.The entire world wants to know, on an iPod, if possible! Just show me, Sol88 qualitative and quantitative how this is supposed to work. Not just tiny quotes from press releases, but the whole thingamajik. Please show in detail that the amount of water group ions that is observed around a comet and in its tail can be produced by this mechanism. Hoping to hear back from you soon with the math and chemical reactions to back yourself up. I do hope you are not holding your breath while you wait. BAC didn't do so well with this one either. I thought this was going to be the "electric comet" thread. So where's all the "electric comet" evidence? Are there no cometary lightning bolt pictures? So far this boring thread is not living up to the promise of its stirring title. See my posts from the Electric Theories thread: Electric Comets I, Electric Comets II: References and Electric Comets III: No EU X-rays. That should provide enough to start the electric comet sparking. Ah well, Tim Thompson, we have been there done that (here and on BAUT). We just get the handwaving and "predictions" from thundercrap, the magical EDM, the even more magical creation of water, etc. etc. But don't expect Sol88 to give you anything real. He never gives real answers, only links to pretty pictures and press releases. He is just a troll. I would not call Sol88 an actual internet troll because if he is then he has been a hugely incompetent one. I would call him ignorant since he has little knowledge of science. I would call him gullible since he is so easily taken in by obvious non-science web sites that are basically selling idiotic books (thundercrap). I do agree that he seems to have an unhealthy obsession with pretty pictures. I mean nothing has really changed in the Electric comet theory camp per say, but evidence for the electric comet model has become much stronger and the dirtysnowball (or whatever mainstreams "model" is ) position has become untenable! Simple and unexciting, apologies again. If your memory needs a little refreshing or you may just not be aware of the two opposing views, then Michael Suede has a fairly succinct summery on the state of play! I mean if it looks like a duck, quacks like a duck and walks like a duck...then it is most likely a DUCK! Observations of the varying orientations of comet tails led to the suggestion of the existence of the solar wind—a continuous outflow of ionized material from the Sun1. It is now well established that gas from comets is ionized by several processes and joins the solar wind2, forming an ion (plasma) tail that points away from the Sun. The plasma environments of three comets have been measured in situ, but only in the upstream direction or less than 8,000 km downstream of the nucleus. Here we report a fortuitous crossing by a spacecraft of the plasma tail of comet Hyakutake (C/1996 B2), at a distance of more than 3.8 astronomical units (550 million kilometres) from its nucleus. This surpasses the tail length of 2 au determined for the Great March Comet of 1843 (C/1843 D1)3. Our measurements reveal that, at this distance, the tail of comet Hyakutake was a structured entity at least 7 million kilometres in diameter. What implication would this paper have on the standard garden variety EC theory and the same "accepted" theory of the mainstream? Like what do they mean several ionization processes?? Tim Thompson? Tusenfem? Reality check?? Last edited by Sol88; 9th July 2009 at 05:48 PM. No implication for the mainstream since they are talking about the ionization of the gas from the comet, i.e. the gas in the tail of the comet. EU is really dumb since it ignores what happens in the tail. Where are the EU electrical discharges and arcs in the tail? Look comet wild bears a resemblance to gaspara, they are both in black and white! Sol88 truly the lamest ever. Comets are not made out of water and ice; they are made out of rock. They discharge a plasma coma due to the rapidly changing electrical field they are moving through. Since they spend most of their time in the outer solar system, they acquire a charge relative to that environment. As it approaches the Sun’s electrical field, it has to equalize its charge rapidly which causes the discharging we see as comet tails. Sure which is why Hyakutake's tail was longer on the way out of the solar system! I mean it acquired more charge didn't it? Care to name a couple of those several processes Reality check??? Namely what process ionizes your "ices"? Is there enough "ice" on the comets nucleus to sustain the amount of OH observed? Why just the finely divided dust? Last edited by Sol88; 9th July 2009 at 07:19 PM. Nice pretty pictures for the visually obsessed who are ignorant about science (hi Sol88!). Only a complete idiot would just compare the pictures. Comets have a darkest surfaces of any objects in the Solar System - including asteroids. Comets have a spectrum that include much more water than asteroids. Comets form tails. Asteroids do not. Comets are much less dense than asteriods. The idiocy of thinking that comets are asteroids needs to be pointed out (yet again) since you know that comets are not asteroids from Tim Thompson. 1 Are black from the arcs as well as the carbon produced! 4 Comets are of a different charge than asteroids. Lets see if we can get this thread on the non-science of the electric comet to the second page before it dies a death. For those EU proponent who still cannot grasp the concept of magnetic reconnection - there is evidence for it in comets: Tail disconnection events. 1. No arcs (X-ray spectrum is wrong) and so no carbon from them. 2. To be expected - the ice is mostly below the surface. To be more exact: organic material is left on the surface as the solar wind boils off the volatile material during each approach to the Sun. 4. You realize that shows that they are different? ETA: Darn - not to the second page yet! Expected in an electric comet! Did Enckes tail display the filamentary form expected by an electric current in a plasma? Not expected in electric comet! Electric comet predicts narrow band X-ray emission: TOTAL FAIL ! Electric comet predicts density like asteriod: TOTAL FAIL ! Sol88 cannot read his sources : The structure is in the coma not tail. Comet coma are essentially plasma in a magnetic field (the solar magnetic field) so standard plasma science predicts ... filamentary structures from the magnetic fields! Thus Enckes coma displayed the filamentary form expected by plasma in a magnetic field. Last edited by Reality Check; 9th July 2009 at 08:36 PM. Comet displays are thought to be due to sublimation of volatile ices from an inert nucleus in the heat of the Sun. For example, the Stardust mission has shown that the origin of comets requires some high-temperature conditions. A 'cross-eye' stereo pair of comet Wild 2's nucleus showing typical EDM erosion. Comet flybys have shown phenomena of great complexity and higher energy than expected. Comet Hyakutake showed unsuspected high-energy processes taking place in the comet. A forbidden oxygen spectral line in the coma of Comet Austin pointed to an intense electric field. Activity is restricted to small areas on each comet nucleus and takes the form of collimated jets, which maintain their filamentary coherence across tens of millions of kilometers. The complex structure and high-energy behavior can be explained if the comet is a charged body moving in a radial electric field responsible for accelerating the solar-wind plasma, rather than an inert, heated body in a rarefied supersonic "wind." The jets and surface topography of comets are consistent with EDM erosion of a cathode surface. The fine dust particles may be the result of cathode sputtering. The presence of the OH radical may be due to combination of sputtered negative oxygen ions from the comet nucleus with solar 'wind' protons and is consistent with the lack of water ice observed on comet nuclei. On the basis of an electrical theory of comets, the author predicted that the Deep Impact mission would observe an electrical flash before impact with the copper projectile and that the outburst would be more energetic than expected. Electric comet predicts narrow band X-ray emission (from EDM), reality is broad band X-rays: TOTAL FAIL ! Care to cite that RC? The citations are in this thread (Tim Thompson links). If you cannot read then you should really go back to school. On second thoughts you are so lazy that you will not be able to scroll back on this page, so: Electric Comets III: No EU X-rays. Last edited by Reality Check; 9th July 2009 at 10:45 PM. Last edited by Sol88; 9th July 2009 at 10:47 PM. Sol88 skills in mathematics ... EPIC FAIL ! Last edited by Reality Check; 9th July 2009 at 10:55 PM. Oh I see it's lighter than water, so it must be made of ice right? but wait, my trollish friend, there is more! Lets' look at the impact dynamics of deep impact, shall we! 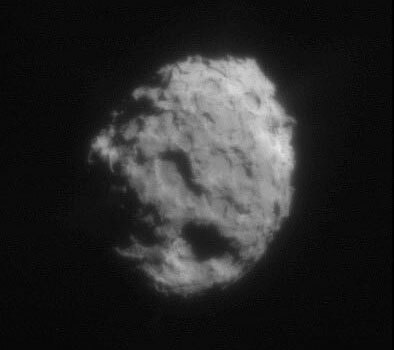 Samples of Comet Wild 2 suggest it is made of rocky material, like an asteroid, rather than the fluffy dust expected of a comet. The object may be a refugee that formed in the asteroid belt before getting kicked to the chilly fringes of the solar system, or it might have formed in that frigid realm from material thrown out of the inner solar system, scientists say. Now, scientists have been surprised again as further study suggests Wild 2 is made mostly of material from the inner solar system, and that the object has a composition more like that of an asteroid than what was expected of a comet. The conclusion comes from a study led by Hope Ishii of the Lawrence Livermore National Laboratory (LLNL) in Livermore, California, US. The team compared particles from Wild 2 with dust grains collected by experiments in Earth's upper atmosphere, whose trajectories suggest they come from comets. They smashed into a rock, you know, like an asteroid! Last edited by Sol88; 9th July 2009 at 11:33 PM. It cannot be made of solid rock (obvious to a child) and so is not an asteroid. It is lighter than water and so it is not a solid mass of ice. What is left oh great genius Sol88 ? Your fails are getting more epic so: EPIC FAIL ! ETA: Hint: Read the citation  and porosity. Hint 2: What is the density of snow? Last edited by Reality Check; 9th July 2009 at 11:31 PM. Tell me about 2060 Chiron, Reality check? The visible and near-infrared spectrum of Chiron is neutral, and is similar to that of C-type asteroids and the nucleus of Halley's comet. In February 1988, at 12 AU from the Sun, Chiron brightened by 75 percent. This is behaviour typical of comets but not asteroids. Further observations in April 1989 showed that Chiron had developed a cometary coma, and a tail was detected in 1993. Chiron differs from other comets in that water is not a major component of its coma, because it is too far from the sun for water to sublimate. At the time of its discovery, Chiron was close to aphelion, whereas the observations showing a coma were done closer to perihelion, perhaps explaining why no cometary behavior had been seen earlier. The fact that Chiron is still active likely means it has not been in this orbit that long. Chiron is officially designated as both a comet and an asteroid, an indication of the sometimes fuzzy dividing line between the two classes of object. The term proto-comet has also been used. Being at least 130 km in diameter, it is unusually large for a comet nucleus. Since the discovery of Chiron, other centaurs have been discovered, and nearly all are currently classified as asteroids but are being observed for possible cometary behavior. 60558 Echeclus has displayed a cometary coma and now also has the cometary designation 174P/Echeclus. After passing perihelion in early 2008, centaur 52872 Okyrhoe significantly brightened. NASA must be children then RC? Last edited by Sol88; 9th July 2009 at 11:59 PM. RCworte NASA must be children then RC? Yet another EPIC FAIL ! Explain Chiron's cometary behavior then RC? Easy under EC, if Chiron like ALL comets, are more or less the same make up as asteroids! The comet is rushing toward the copper projectile at almost 23,000 mph, which will not give time for the copper projectile in the exceedingly thin cometary plasma to balance its electrical potential with that of the more negative comet nucleus. If (and it's the biggest "if") Tempel 1 is sufficiently electrically active before impact, we may see the usual non-linear behavior of plasma when subjected to increasing electrical stress. That is, there will be a sudden electric discharge, or arc. An electric discharge between the comet cathode and the copper projectile anode will result in X-ray emission, just as in any X-ray machine on Earth. Such X-rays are easily identifiable and in large amounts would be anomalous for a mere impact. So, before physical impact occurs, we may expect a sudden discharge between the comet nucleus and the copper projectile. It will have the characteristic light-curve of lightning, with rapid onset and exponential decay. The question is, will it be a mere spark or a powerful arc? Whether due to impact or electric arc, positively charged copper ions may be expected to produce radiation by recombination with free electrons. A small proportion of that radiation may be in the x-ray region. But the spectrum and intensity curve for radiation from an impact should be quite different from the flash of an electric arc impinging on a copper anode. The arc should also give a restricted, almost point, source for the radiation from the target sites on the impactor and the comet nucleus. This is quite different from anything expected from distributed explosion products. Which is confirmed, though the origins differ, one from a prediction, one from a guess! As the impactor entered the nucleus, or shortly thereafter, a brilliant flash, lasting less than two tenths of a second, appeared probably as the impactor and part of Tempel 1 vaporized. The first flash was followed by a second presumably originating deeper within the comet. The second flash was brighter still and it momentarily saturated some pixels in the instruments on the flyby spacecraft. Deeper than 200m? Vaporized the probe? into a snowbank? There was much more material in the curtain than expected indicating that the strength of the material lying within tens of meters of the comet's surface is very weak and powdery. Therefore the ejecting gas and dust are able to tear an unexpectedly great amount of material from the crater as it forms. RC any links on that claim for narrow band X-Ray production! Last edited by Sol88; 10th July 2009 at 01:01 AM. Yes and you totally missed it ! In fact no citations are needed for anyone who can think. Hint 1: What is an electrical discharge? Last edited by Reality Check; 10th July 2009 at 01:10 AM. Why just the finely divided dust what? What is finely divided dust anyway? 1. Please show us evidence of this arcing and the EDM. Why did none of the experiments that flew through the region of interest for this process measure any of the "side effects" of this discharging? I have mentioned [rul=http://www.agu.org/journals/ABS/1991/90JA02459.shtml]this paper by Laakso[/url] before, that there are indeed electric fields near the comet and such stuff. There is loads of interesting stuff happening in the coma, howerver, if there had been EDM they would most definitely measured it with their experiments. 2. This is not even a sentence! You mean to say that comet's nuclei have no water, however, why are there jets observed coming from the nucleus? Are those jets produced by EDM or something? Please show us that that can happen. 3. Okay, why don't you start explaining it, how it works exactly and no links to thundercrap please, because he does not know an explanation from an excrement. 4. Really, and how did you decide that, did you measure it? And for those who want the gory details, they can read the paper by Vourlidas et al. (2007). Methinks that the EC gang does not really keep up with literature, I am sure they have never read the paper by Laakso (see above) which is highly relevant. Who want so search JREF for the discussion of this "poster" (with NO references whatsoever). This document has been pulled to shreds already, maybe DeiRenDopa knows where to find it. I might try to find it too later. Ever heard of porous material? Apparently, the only way that the EC can "explain" the electric nature of a comet is by misinterpreting and badmouthing the mainstream model. It is the old fallacy of letting mainstream defend all their claims, making no claims themselves and then if one little thingy does not fit, EC says "yeah! our model is correct." But ... there is no EC model! Nothing has been presented apart from handwaving arguments etc. Show us the money, Sol88 and Zeuzzz, and don't forget that that "poster" by thundercrap is not a valid model. I want a detailed model presented here, and I want it now.